This shop showcases my works created at my studio in Rahatni, Pune where I create my sculptures, participate in exhibitions in India and abroad. These are my passionate expressions about nature and its conservation. I conduct workshops for all age groups as it motivates me to experiment more through teaching. I am also a member of NCECA, National Council for Education of the Ceramic Arts , U.S.A., and visit exhibitions outside the country. 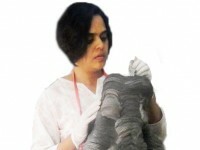 Madhavi is a self taught ceramic artist. She has graduated in law but found her true calling in clay during the same period. Having learnt the basics in ceramics under the able guidance of  renowned Pune based artist , Mr. Bal Wad, she continued with her experiments and primarily focused on the coil method of building in clay. Madhavi has shown her work in India and abroad . She is a member of NCECA, National Council for Education of the Ceramic Arts, USA. Her works are part of collections in India. She is also an active participant in conserving nature. Orders will be shipped within 6-8 working days, through reputed couriers only. Please do not accept the consignment if it appears damaged or tampered with. Given the nature of the material of my sculptures, please expect a little variation in color/finish between the pictures and the actual products.